GILBERT, AZ FEBRUARY 13, 2013: The Arizona Short Course Championship and Lucas Oil Regional Off-Road Series Arizona presented by ADS Shocks will kick off the 6 round season on Sunday at the Firebird International Raceway in Phoenix, AZ. 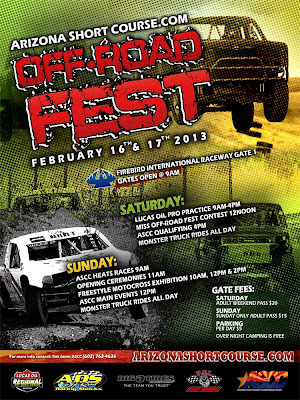 Come watch the pros test and tune on Saturday, with the Miss Off-Road Fest contest and qualifying for Sunday’s race. Sunday will be a full day of green flag racing with 6 lap heat races and 10 lap Main Events. There will be Monster Truck Rides both day’s for the family, and on Sunday there will be Freestyle Motocross Exhibitions. “We are very excited to kick off the season! Last year we saw a lot of drivers enter the series for the first time, and we are looking forward to adding even more drivers to our ASCC family this year,” said Tim Jones, President of the ASCC/ Lucas Oil Regional Off-Road Series Arizona. Spectators are welcome to watch the excitement at Firebird International Raceway and join in on the action. Get a sneak peak on Saturday at the official test and tune day for Pro LOORRS Drivers from 9am to 4pm when the track will turn to Regional 4 lap qualifying races from 4pm to 5:30pm. 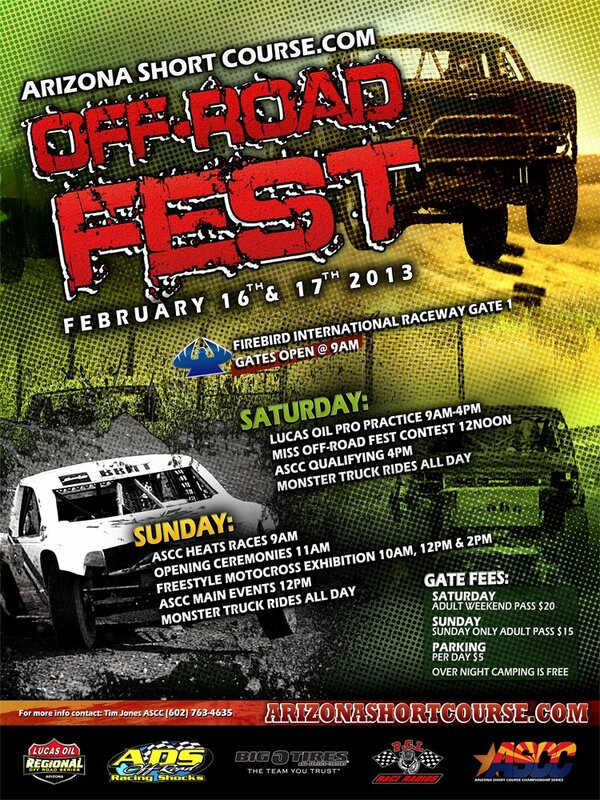 The Miss Off-Road Fest contest will be at 12noon and there will be Monster Truck Rides all Day. Sunday is the main race day. The ASCC 6 lap qualifying races will start at 9am. At 11:45 ASCC will host the official opening ceremonies followed immediately by 10 main events each 10 laps long. The Monster Truck rides will continue all day Sunday and there will be Freestyle Motocross Exhibitions at 10am, 12pm and 2pm. Racing will end around 5pm. There are 14 different classes that drivers compete in at the ASCC Lucas Oil Regional Series: 1. Open V8 Truck 2. Ultra 4×4. 3. BigO Tires Unlimited UTV 4. Stock RZR UTV 5. McMullen Fabrication and Transaxel Jr2 Karts 6. Jr1 Karts 7. Arizona Luxury Lawns & Greens Modified Karts 8. Open Pro 9. Weller Racing SR1 UTV 10. Hellion Mini Stock Trucks 11. Mini Mod Trucks 12. Foddrill Limited Buggy 13. Foddrill’s 1600 Desert Limited Class – There is an additional $500 purse on this class for the opening round compliments of Foddrill Motorsports. 14. Select Glass Full Stock Trucks. All classes are racing for the Kary Environmental Checker Flag! There are classes for the young kids up to the professional open classes making it a full day of action for all to enjoy.